We are specialized in sculptures created by master carvers and well-established artists who work in the rare, highly valued stone called serpentine. While it is harder than soapstone, serpentine still is fairly easy to carve. It is an ideal carving stone because of its beautiful coloring and because it can be polished to a high degree of brightness. Serpentine is found in various shades of green, grey or black. Thus, a rough piece of serpentine, once completed into a work of art, is noteworthy for its overall visual beauty. 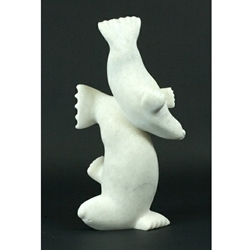 Cape Dorset sculptors also create works in marble, another rare stone which the Inuit quarry in the summer along the southern coast of Baffin Island.